Wednesday, March 2: Rockford at Grand Rapids, 6 p.m.
Saturday, March 5: Lake Erie vs. Rockford, 7 p.m.
Sunday, March 6: Lake Erie vs. Rockford, 4 p.m. The Rockford IceHogs picked up half of six possible points in Week 21 to hold onto their top spot in the Central Division. A six-goal outburst helped the IceHogs break a first-place tie with the Admirals before the team took a regulation and overtime loss in Lake Erie. Vince Hinostroza had five points (3g-2a) during the week in his return to the team from the Chicago Blackhawks. The three games were a part of a season-long five-game road trip, which will culminate with a visit to Grand Rapids this Wednesday. Vince Hinostroza came back to the IceHogs lineup in a big way in Week 21, notching three goals and two assists following his stint with the Chicago Blackhawks. Hinostroza put the Milwaukee Admirals away with two goals 23 seconds apart on Wednesday in Rockford’s 6-4 win, and had a highlight reel pass to set up the game-tying goal which forced overtime on Saturday at Lake Erie. His five points helped him take the team lead (32), and he is currently riding a four-game point streak dating back to Feb. 12. Wednesday, March 2 at Grand Rapids Griffins: Game starts at 6 p.m. The IceHogs make their final regular season trip to Van Andel Arena to take on the Griffins. Rockford has gone 2-3-1-0 versus Grand Rapids this season. Saturday, March 5 vs. Lake Erie Monsters: Contest begins at 7 p.m. Rockford returns to the BMO Harris Bank Center for a rematch of last weekend’s set versus Lake Erie. Vienna Beef is sponsoring Scott Darling Bobblehead Night for the first 2,500 fans. All seats for the game have been sold, with limited standing room only tickets remaining. Sunday, March 6 vs. Lake Erie Monsters: Puck drops at 4 p.m. 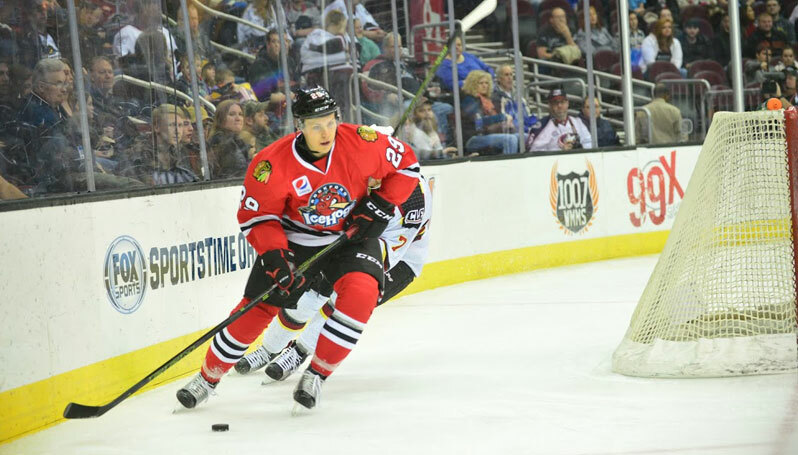 The IceHogs wrap up a pair of back-to-back games versus the Monsters. The team will host a postgame skate on the BMO Harris Bank Center ice for fans who bring skates to the game.